Hillary Chybinski: Looking for an Alternative to Sugary Treats with Halloween? Looking for an Alternative to Sugary Treats with Halloween? With so many kids with food allergies and sensitivities - I have always offered an alternative to candy to my trick or treaters. (I give out candy too). But when Ryan was just a baby, and we brought home a plastic pumpkin filled with candy he couldn't (and I wouldn't want him) to eat, I realized you need to have some options. So each year I pick up some bubbles, erasers, or play-doh to hand out to babies, toddlers and kids that don't want (or can't have) candy. 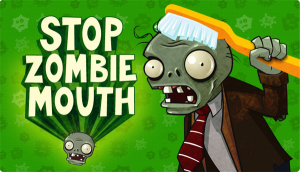 This year, I learned that the American Dental Association partnered with PopCap on a Stop Zombie Mouth campaign, to offer free trading cards and game codes instead of candy. HOLLA! The American Dental Association (ADA), the leading source of oral health-related information, and PopCap Games, a leading digital games creator and a division of EA, have partnered to raise awareness of the importance of kids’ oral health in addition to providing a fun alternative to sugary treats on Halloween night. And the BEST part? YOU can do it too!! 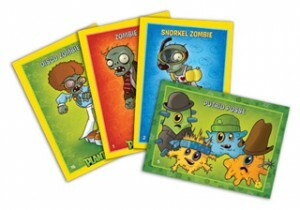 To give away PopCap’s hit Plants vs. Zombies instead of sweets for Halloween this year - you can download free game coupons (redeemable for the full PC/Mac edition of Plants vs. Zombies) at http://stopzombiemouth.com. So give kids something they can enjoy LONG after Halloween is over, and something their Dentist will be happy about too! note - I was given packs of cards to hand out for Halloween to facilitate this post. As always, all opinions are my very own. For additional information, please see my disclosure page. thanks for the web site! I like to give out mini play doh and mini microwave popcorn. this year I am giving out the playdoh and mini packs of pretzels. I like candy, but too much sugar. I haven't even bought any this season. which is change for me! We don't give out much candy either. We buy a small bag of chocolate for the neighbor kids but give out bags of pretzels or other non-sugary snacks too. I love this idea and am heading over to the site right now. I hope you both got some to give out - my Trick or Treaters LOVED them - the older kids were totally excited and telling each other on the street. Such a fun and different thing to do.